There are many large sweet chestnut trees throughout Europe, but none can match up to the legendary Hundred Horse Chestnut in eastern Sicily. The ancient tree’s story goes back thousands of years, an incredible feat considering its location just a few kilometers from one of the world’s most active volcanoes. That volcano is of course Mount Etna, the enormous volcano between Messina and Catania on the island of Sicily. Due to its size and location, historical records of eruptions go back several millennia. The earliest written accounts are attributed to Diodorus Siculus, a Greek historian from the 1st century BC. The imposing presence of the volcano also managed to make its way into Greek and Roman mythology. Hephaestus (or Vulcan), the god of blacksmithing and fire, is said to have kept his forges beneath the fiery crater. There are even legends of Zeus trapping the serpentine giant Typhon in the volcano when he attempted to overthrow his rule. Aside from the destruction caused by frequent eruptions, the volcano has been a boon to local agriculture. The soil on its slopes is exceptionally fertile, and today they are filled with countless orchards and fields – as well as one particularly large sweet chestnut. The exact age of the Hundred Horse Chestnut is not known, and estimates vary wildly from 2000 to 4000 years. Even on the low end the tree dates back to the time of Julius Caesar just to the North. Rooted less than 8 kilometers (5 miles) from the active volcano, it’s survived (and benefited from) countless eruptions. Although it was well known to Sicilians, the tree didn’t become internationally famous until the 16th century. By then, it had grown to an incredible size, which is exactly what led to its fateful run in with royalty. Joanna (aka Juana or Giovanna) of Aragon was the Queen of Naples at the time, and the second wife of King Ferdinand I of Naples. Aragon had ruled Sicily since the War of the Vespers in 1282, and it was one of the most powerful families in Southern Italy. But their power was nothing compared to Mother Nature, and when a severe thunderstorm rolled in during her visit to Mount Etna, she needed to seek cover. 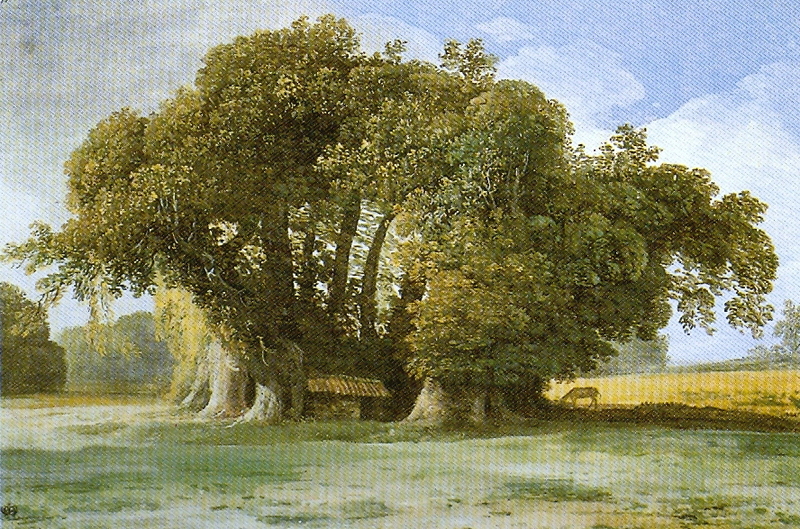 Fortunately, a nearby chestnut tree was able to provide shelter to both her and her company of 100 mounted knights and retainers until the storm blew over. Henceforth the tree was known as the Hundred Horse Chestnut (or Castagnu di Centu Cavaddi in Sicilian). 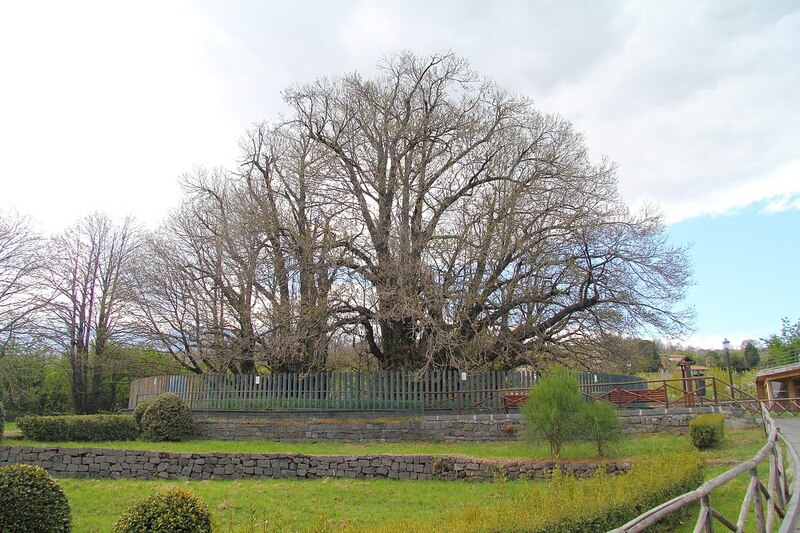 The tree was measured in 1770 (and again in 1780) at an incredible 58 meters (190 feet) in diameter. This measurement was later included in the Guinness Book of World Records as the ‘Greatest Tree Girth Ever‘. Although the tree is the oldest known chestnut tree in the world, there are several other trees (mostly conifers) that are older. Time eventually took its toll on the tree, and it has since cracked and split into 4 separate trunks. 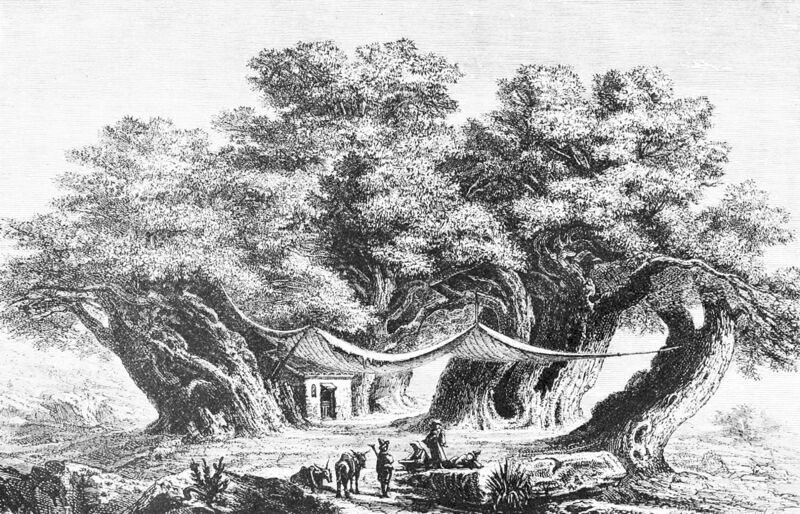 Villagers took advantage of the space within the tree to build a small hut. There, they stored the season’s harvest of chestnuts. When one of the four trunks withered and died, the space within the tree was big enough to fit a carriage. And that’s exactly what it was used for – a small road passed through the tree for several hundred years. Today, the tree is alive and well. The road beneath it has long been closed and a fence protects the ancient roots from excessive foot traffic from tourists. But each day, for just a few hours, the gates are opened so visitors can experience the majesty of the world’s largest chestnut tree up close. Without its leaves, the true size of the Hundred Horse Chestnut can be seen – photo credit Rabe! If you enjoyed this article about the Hundred Horse Chestnut, check out the archive for more amazing tree stories. Also check out the Facebook page, with a few extra tree goodies throughout the week. Subscribe below to receive notifications whenever a new tree story is published. 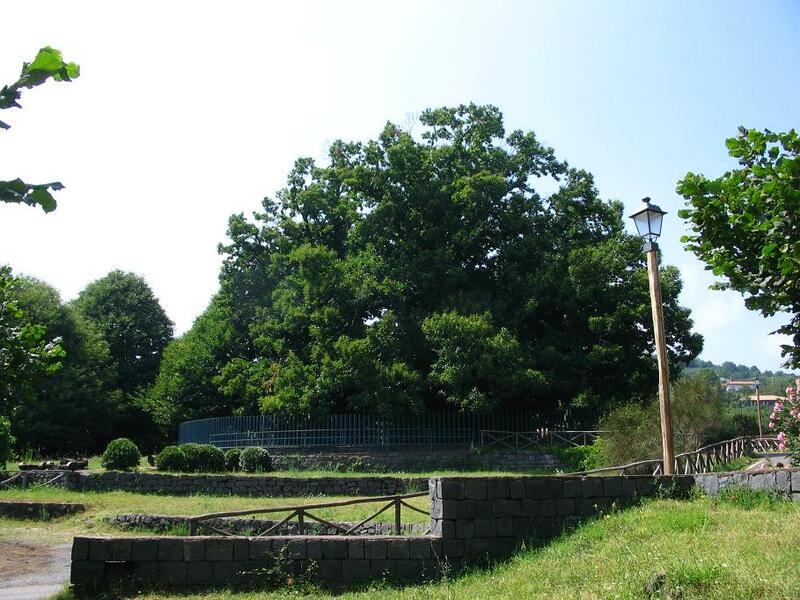 It is amazing to find out how the hundred horse chesnut has survived the Etna’s eruptions along history. What a wonderful story of endurance and I love the historical pictures. We plan to go to Sicilia later in the year – you have put this magnificent tree on our agenda. Thank you for sharing! It’s extraordinary just to look at as a structure (in the picture), then to discover the history that’s rooted in this living relic makes you view it in a completely new light. Fascinating. Goodness! That is old! We have older trees here, but we expect them to be so old. This is more impressive for a chestnut! There are a few of these super old chestnut trees in Europe. Most ancient trees are conifers, so they truly are special!